The peyote cactus (Public domain photo). Yet another Martin Wagner discovery: "Of Transcendental Beauty and Crawling Horror," describing some of Robert Anton Wilson's early experiences with marijuana, peyote and belladonna. He wrote it as "Ronald Weston" for the first issue of "Fact" magazine in 1964. 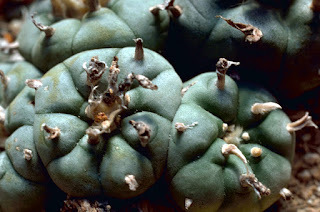 The peyote experiences were new to me. The frightening encounter with belladonna appears to be the same incident depicted in "La Belle Dame Sans Merci" in Email to the Universe. At the end, RAW writes that he has decided to give up messing with hallucinogens and leave them to the experts. There is no mention of Timothy Leary in the piece.